With 180mm of travel, the frame is constructed from our M5 Premium Aluminum that's equal parts, strong, lightweight, and incredibly responsive. The design of the frame, itself, revolves around our Trail Geometry that includes all of our trail hallmarks, like a low-slung bottom bracket, roomy top tube, and ultra-short chainstays. Cable routing is all internal, including that of the Command Post Wu, while the battery is fully integrated in the down tube and the motor is secured by a forged brace mount. 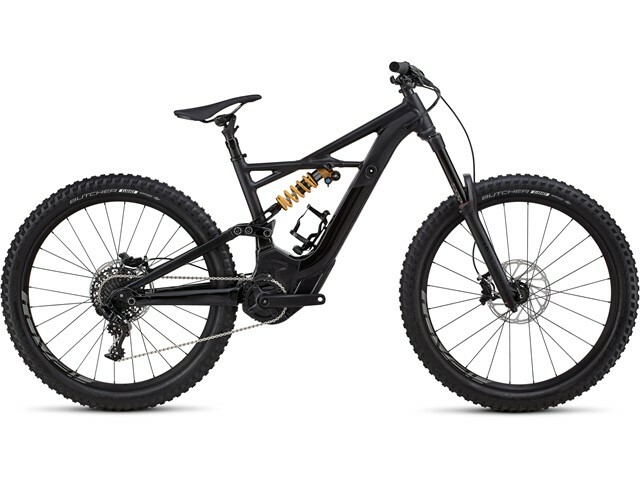 The custom Specialized 1.3 Rx Trail-tuned motor is built for the Kenevo and features a 15% power increase and a significant efficiency increase when compared to the Specialized 1.1 motor. This successfully places it at the top of e-MTB motor technology. It has many other features that no other e-bike can touch, like instant engagement, fantastic heat management, a double freewheel design that disengages the gear box when you hit top speed, and silent, smooth, and consistent output—even at max power. The Specialized M1-504 battery features an integrated Trail Display and ANT+/Bluetooth® module with Mission Control App connectivity. It houses 504Wh of trail-taming juice, is easily removable, and it's neatly integrated into the down tube. Butcher, GRID casing, GRIPTON® compound, 2Bliss Ready, 27.5 x 2.8"